DWF - The Digital Watch Forum • View topic - Speedmaster lcd 1620 . Have a Omega speedmaster lcd 1620 in the below model. Having trouble with the pushers. They are very stiff. I think it's because of the seals are worn. Has anyone here been working on one of this? And now if it's possible to change them? Have looked for new pushers but they seam to be obsolete? So my thought was if the o-rings could be changed? Re: Speedmaster lcd 1620 . These are press to fit. So extraction is special press. The extraction may damage the pusher, but might not. I did pick up some NOS for my speedmaster but not from Omega; all models take the same pusher. But I did pick up the last 4 in Sydney Australia. I would remove the movement. 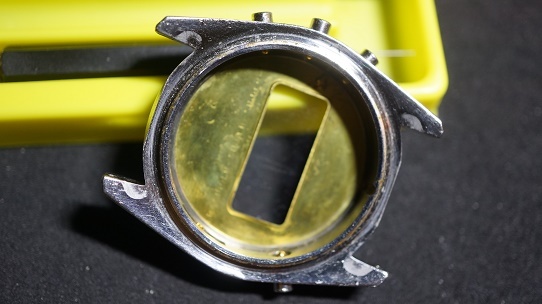 Place the case in a soapy warm water solution and work the pushers to remove or dislocate the DNA and other gunk that works its way under the pusher cap. Use an artist fine paint brush to aid in the cleaning. Then find some liquid or spray silicon at the automotive shop for spraying your rubber door trim and trunk seals. I place a bunch of this (thimble full) in a jar. Then using the paintbrush and having dried the case thoroughly, apply a good drop under the pusher cap on the exterior and then another drop on the interior of the case at the pusher. Work the pushers and gently warm the case gently with a hair dryer. Repeat and work on the pushers. Finish off with silicon grease (Seiko) or I use from the electronics shop; dielectric clear silicon grease (big tube and cheaper). Apply under the cap with the brush and the interior also. This has solved many Seiko, omega and rescently two Zenith Futur that I have got running. 767Geoff wrote: These are press to fit. So extraction is special press. The extraction may damage the pusher, but might not. Fantastic info Geoff .Will try for sure. To bad about finding any new pushers . But this will sure help. Sorry i posted it in the wrong forum part . That is the nicest version of the speed masters, I think. Let us know how the cleaning and lube works. Movement out and i am cleaning the pushers. Would have been easier with the crystal out? I am actually thinking of replacing the crystal anyway. Look in an other thread . As i could have cleaned everything in the Ultrasonic bath? Or will the insert risking get damage? Have got 4 out of 5 pushers going.The pusher for light and split is a little stiff.